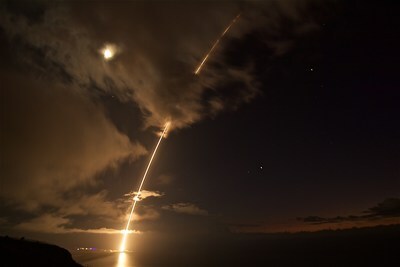 PACIFIC MISSILE RANGE FACILITY, Hawaii, Aug. 30, 2017 /PRNewswire/ -- A Raytheon (NYSE: RTN)-built Standard Missile-6 intercepted a medium-range ballistic missile target at sea in its final seconds of flight, after being fired from the USS John Paul Jones. The SM-6 missile can perform anti-air warfare, anti-surface warfare and – now – even more advanced ballistic missile defense at sea. "Earlier this year, our customer requested an enhanced capability to deal with a sophisticated medium-range ballistic missile threat," said Mike Campisi, Raytheon's SM-6 senior program director. "We did all this – the analysis, coding and testing – in seven months; a process that normally takes one to two years." This was the third time that the SM-6 missile successfully engaged a ballistic missile target in its terminal phase. It was first tested in a successful flight test mission in August 2015, and then again in late 2016. Deployed on U.S. Navy ships, SM-6 delivers a proven over-the-horizon offensive and defensive capability by leveraging the time-tested Standard Missile airframe and propulsion system. It's the only missile that supports anti-air warfare, anti-surface warfare and sea-based terminal ballistic missile defense in one solution—and it's enabling the U.S. and its allies to cost-effectively increase the offensive might of surface forces. Raytheon has delivered more than 330 SM-6 missiles with continuing production. The U.S. Department of Defense has approved the sale of SM-6 to several allied nations.